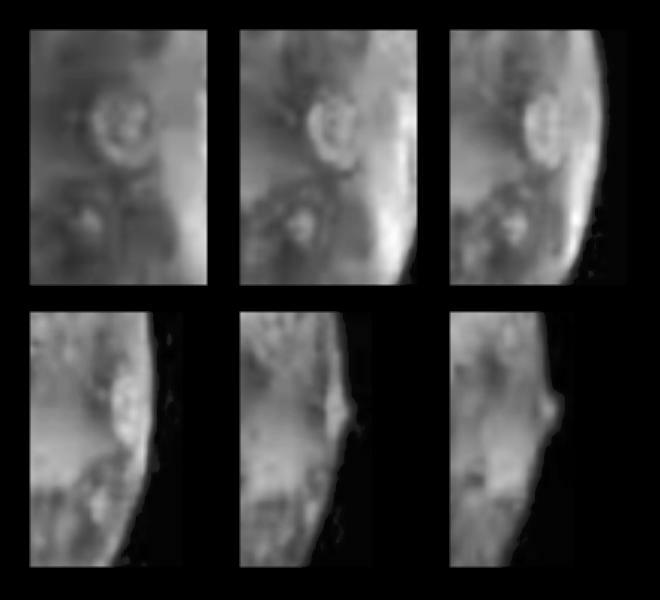 Six views of the volcanic plume named Prometheus, as seen against Io's disk and near the bright limb (edge) of the satellite by the SSI camera on the Galileo spacecraft during its second (G2) orbit of Jupiter. North is to the top of each frame. To the south-southeast of Prometheus is another bright spot that appears to be an active plume erupting from a feature named Culann Patera. Prometheus was active 17 years ago during both Voyager flybys, but no activity was detected by Voyager at Culann. 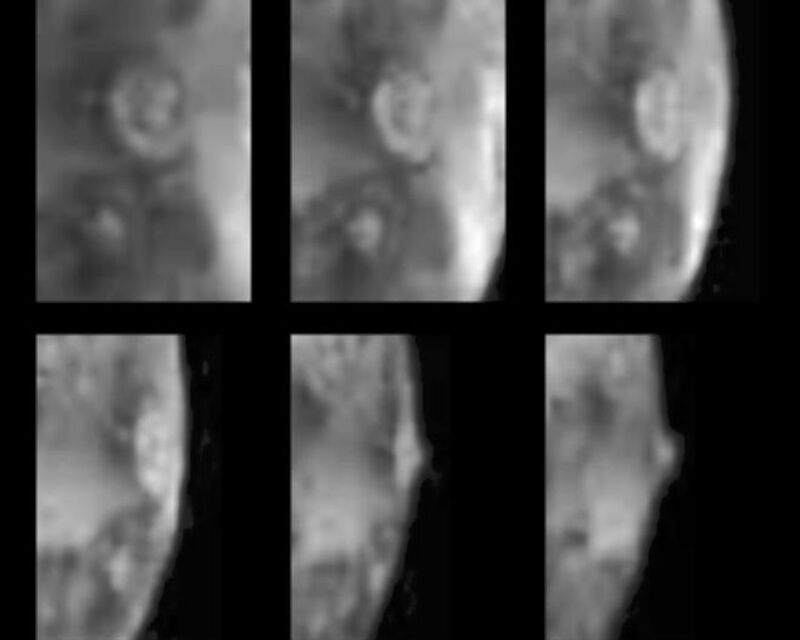 Both of these plumes were seen to glow in the dark in an eclipse image acquired by the imaging camera during Galileo's first (G1) orbit, and hot spots at these locations were detected by Galileo's Near-Infrared Mapping Spectrometer. The plumes are thought to be driven by heating sulfur dioxide in Io's subsurface into an expanding fluid or "geyser." The long-lived nature of these eruptions requires that a substantial supply of sulfur dioxide must be available in Io's subsurface, similar to groundwater. Sulfur dioxide gas condenses into small particles of "snow" in the expanding plume, and the small particles scatter light and appear bright at short wavelengths. 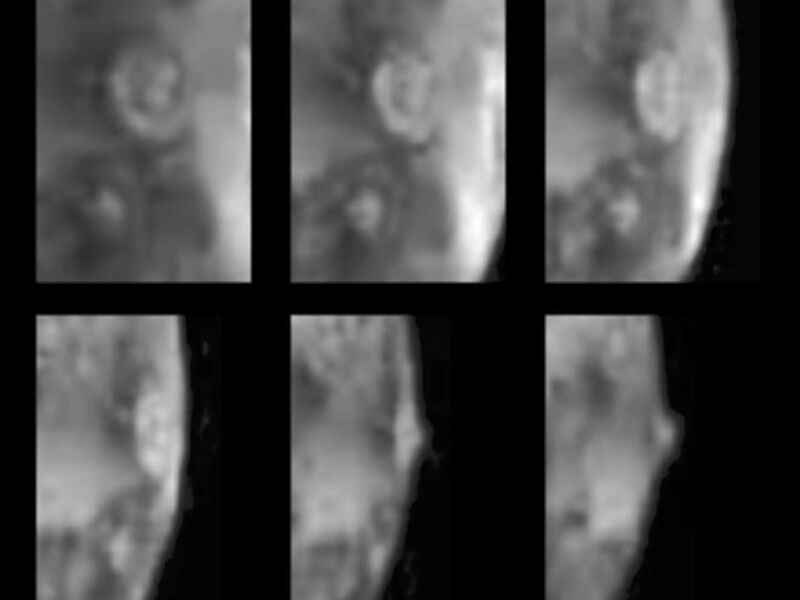 The images shown here were acquired through the shortest-wavelength filter (violet) of the Galileo camera. Prometheus is about 300 km wide and 75 km high and Culann is about 150 km wide and less than 50 km high. 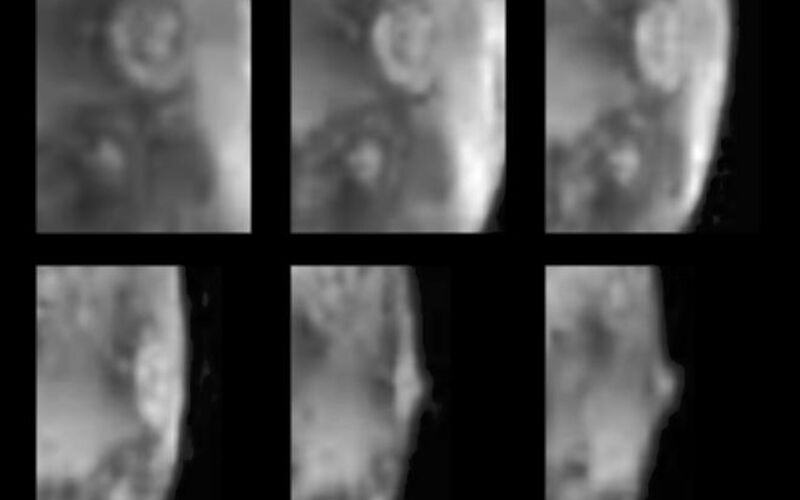 The images were acquired on September 4, 1996 at a range of 2,000,000 km (20 km/pixel resolution). Prometheus is named after the Greek fire god and Culann is named after the Celtic smith god.